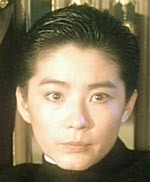 Brigitte Lin Ching-hsia was discovered walking down a street in Taipei at the age of seventeen and made her film debut at the age of 19 in Outside the Window - and stardom soon followed. During the 1970’s this actress was a hugely popular star in Taiwan – churning out weepies and light comedies – and becoming basically the sweetheart of Taiwan and the many Chinese communities around the world. From her debut through the Taiwanese weepie days – through the uncertain period of her campy collaborations with director Chu Yin-Ping (Demon Fighter, Amazon Commandos, Fantasy Mission Force, Pink Force Commando, Seven Foxes) in the early 80’s to her “re-discovery” and “re-invention” under the direction of Tsui Hark in Zu and Peking Opera Blues. Finally to the glorious years of the early 90’s to her all too early retirement in 1994 on the cinematic highs of Ashes of Time and Chungking Express.